Subcritical experiments obtain technical information about the U.S. nuclear weapons stockpile in the absence of nuclear testing. In subcritical experiments, chemical high explosives generate high pressures, which are applied to nuclear weapon materials, such as plutonium. The configuration and quantities of explosives and nuclear materials are such that no nuclear explosion will occur. Thus, the experiments are consistent with the existing U.S. nuclear testing moratorium. These experiments are called "subcritical" because there will be no critical mass formed, i.e., no self-sustaining nuclear fission chain reaction will occur. Scientific data is obtained on the behavior of nuclear weapon materials by the use of a wide variety of sophisticated, high-speed diagnostic instruments. The underground U1a Complex is the location for subcritical experiments. The U1a Complex is an underground laboratory consisting of horizontal tunnels, each about one half mile in length, where experiments supporting the Nation's nuclear stockpile are conducted. The U1a Complex is mined at the base of a vertical shaft approximately 960-feet below ground surface. The vertical shaft is equipped with a mechanical hoist for personnel and equipment access while another vertical shaft, about 1,000 feet away, provides cross ventilation, instrumentation and utility access, and emergency exits. The National Laboratories most recently kicked off the Lyra Subcritical Experiment (SCE) Series. The Lyra Series, similar to the previous Gemini Series and Leda Experiment, has two surrogate experiments, Orpheus and Eurydice, and one plutonium experiment, Vega. Orpheus, the 49th subcritical experiment conducted at NNSS, was completed with high success in September 2015, and will pave the way for the remaining experiments in 2017 and 2018. 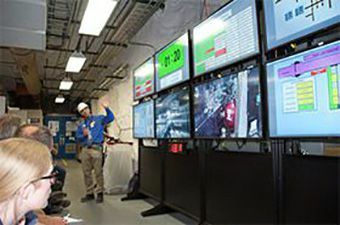 Each of the Lyra Experiments uses insensitive high explosive (IHE), rather than conventional high explosives (CHE), supporting the nuclear pit reuse program and providing hydro data. Two new diagnostics were also developed and implemented: high dynamic range photon Doppler velocimetry (PDV) and dynamic stereo surface imaging. The NNSS’s revolutionary multiplexed photon Doppler velocimetry (MPDV) has transformed the data richness of SCEs by providing thousands of times of increased data with minimal sacrifice in quality.